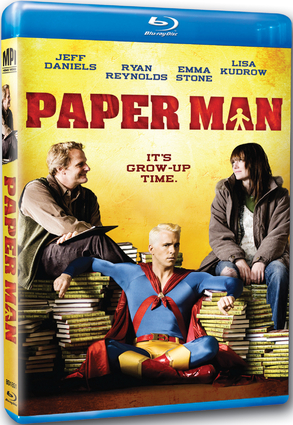 We’re partnering with MPI Media to give away a gift pack for the Blu-Ray release of “Paper Man,” starring Ryan Reynolds, Jeff Daniels and Lisa Kudrow (watch the trailer – available on Blu-Ray and DVD today!). Daniels plays a novelist with some pretty serious writer’s block, and Reynolds is his imaginary friend, Captain Excellent. The gift pack includes a Blu-Ray of the movie, plus an Amazon Kindle. Entering is easy: just comment on this post with your LT username, and we’ll pick the winner at random at 3 p.m. EST on Friday (21 January). Multiple comments will not increase your chances of winning. Update: Congratulations to LTer aglaia351, the winner of this giveaway. Enjoy! This sounds like a fun movie and a great opportunity to see it. Sounds good to me! User name Talbin. <3 Jeff Daniels. This movie looks pretty interesting! I saw this movie at a film festival – it’s pretty good. Emma Stone and Kieran Culkin are great in it. username is rjmoren and this sounds like a very cool contest! My LT name is shelfmonkey. My LT name is elenchus. Wait, there’s a Ryan Reynolds movie that I haven’t heard about, yikes. Sounds interesting. … and I don’t type much so my initial try was rejected. tkraft would really like to win! Woot! Oh, I absolutely love Ryan Reynolds…although his hair is a bit funky in this one. user name bbellthom. Movie looks good and who doesn’t love to win free stuff. user name is zzhupinga hope I win! Caffron here, and I’m game! Looks like fun – and a great cast! Wish me luck! (Oh, and the Kindle wouldn’t be too bad either). My username is _debbie_. What fun contests are!! Thanks! If I win this, I promise not to catalogue it on LibraryThing. This is a surprising contest, but interesting nonetheless. I’d never heard of the film before now! That couch made of books in the trailer looks so cool. Great idea – here’s to more giveaways from LT! Can’t wait!! This may get me into the e-book world after all. Library Thing partnering with MPI Media partnering sounds AWESOME!!! Plus Amazon!!!! I hope there are MORE of these!!! Count me in! The movie looks fascinating! Looks like a movie I would enjoy. A book-related movie AND a Kindle?? How can you go wrong?? Definitely looks like something I would enjoy watching. Thanks! Looks interesting and my grand kids can show me how to use them. Won’t have much use for the Blu-ray, but a Kindle would be fun! This one looks interesting. Plus, Kindle! The trailer looks great; would love to see the movie! Vegetrendian would be ecstatic to win this prize pack! Vegetrendian2 is in the game, and excited at his chances! vegetrendian3 wants in on the action too! This is fun! I’m in! wow a kindle and a movie. Jeff Daniels FTW. Count me in. Shiny. Hmm, that was too short. More shiny? This is a fabulous offer. Kindle has my mouth watering. This movie generated some buzz when it first got its limited release and I am a huge Ryan Reynolds and Emma Stone fan. Jeff Daniels is great too. I would love to win this. sounds interesting – both the movie and the kindle. Greedy camel was too short. I’m skeptical of a Kindle, but…I’ll bite. Thanks! I am happy to accept gifts. Open to Aussies as well? Awesome giveaway – count me in! There is nothing like overcoming writer’s block with Jeff Daniels and Emma Stone. A 2 in 1 deal. How awesome is that!! Oh, this is exciting! Count me in. I have really been wanting a kindle! Hope I win! This sounds too good to be true. The movie sounds great but a Kindle too, that is even better. I’d be happy with either or both :). Good luck to all. Books and movies – my two most favorite things! Sounds like fun! Not sure if I will like a Kindle, because there’s nothing like a real book, but I bet somebody in my family will enjoy it. I WANT IT, I WANT IT, I WANT IT!!!!!!!!!!! I would not mind having these. Sounds like a great movie and with a free Kindle. Count me in. I don’t care so much about the movie, but the Kindle, that’d be nice. Please? S’il vous plaît? Por favor? ПОЖАЛУЙСТА? Per favore? NielsenGW would like a crack at the prize pack! Who wouldn’t love a change at this one? Tea_and_Tomes sure would, that’s for sure! Awesome giveaway; sign me up! melthefishy thinks this prize is amazingly wonderful, and hopes everyone has a lovely weekend. hoping I can import my books from goodreads! Can we non-us types play too ? That looks like an interesting film! OK, I admit I’m commenting solely for the chance to win a Kindle. Wow — would love to win the movie and kindle. My fingers are crossed. Sounds exciting! Sign me up for the contest! Another reason I LOVE LibraryThing! ForeignCircus would love a new Kindle! great idea for a contest. I’m smileydq and I would love to win! Oh how I would love to win. YIPEE! Wow. 180 comments! Very impressive. The period for entries is now closed. Off to pick a winner! Congratulations, and thanks to all for participating! Now get working on the next contest, submit your non-English bookpiles by January 31! Hey, that’s not fair! You gave us a deadline of 21 January and emailed me about it on 25 January. Dr Who declined to assist Dr McAulay with her time-travel, so I’ve missed the bus. Sigh! Hey Karen, sorry you missed this one. The contest referred to in January’s State of the Thing is the other we’ve got going, for international bookpiles. Entries for that are due on Monday (31 January). This one was a shorter-term giveaway. You can always add the LT blog to your bookmarks or RSS reader so you don’t miss these! That’s known that cash can make us autonomous. But what to do if somebody does not have cash? The one way only is to try to get the loan and commercial loan.